A caricature in a world of very serious characters tends to stand out. 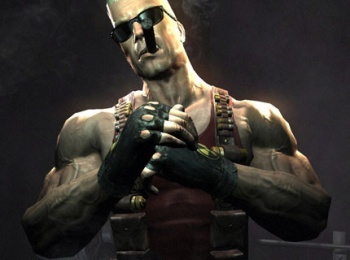 Randy Pitchford , the head of Duke Nukem Forever developer, Gearbox Software, says that being stitched together from old action movie tropes and clichÃ©s actually makes Duke Nukem one of the most unique characters around today. Pitchford said a lot of developers - Gearbox included - were aiming for realism with their action game, and so their protagonists were often rather serious. In that environment, he said, Duke's uncomplicated motivations and ridiculously overblown, hyper-macho persona tended to make him stand out. Pitchford also thought that this tongue-in-cheek portrayal of Duke as an "All-American Hero" was what made the character so popular internationally. While Duke himself may be a relic from an older time, Pitchford wanted to make it clear that his game was not. Pitchford said that because Duke Nukem Forever had been in development for such a long time some people might be expecting for it to feel like a game they might have played ten years ago, but that it was actually a thoroughly modern game. Pitchford said that Gearbox had worked hard to maintain a balance between modern sensibilities and the kind of game experiences that he referred to as "timeless." Duke Nukem Forever comes out for PC, PS3, and Xbox 360 on June 10th in Europe and Australia, and on June 14th in North America.